Let’s get the big question out of the way: Should you buy Special Edition if you already own the original? The answer is no. The extent of Special Edition’s additions is all downloadable content that is readily available on the PlayStation Store, and you could indeed purchase and download all the included content and “upgrade” yourself to the Special Edition without having to buy another physical game. What exactly is included? I’m glad you asked. As you can see, only two of the inclusions are actual playable worlds with new levels. The rest are costumes that, while fun for playing dress-up, don’t actually give you anything new to do. I should also point out that Special Edition doesn’t actually include all the Toy Story costumes, as there are two other costume packs based on the movie sequels available on the PlayStation Store. According to my advanced calculations, these goodies add up to just under $31 in downloadable content, though the game’s case claims it’s “over $35.” Maybe the DLC was more expensive at some point; I don’t know. Either way, it’s still a substantive amount of stuff. The Move Pack, heavily advertised on the game’s case, is a fun little world of 5 levels, 7 mini-games and 2 cut scenes. Unsurprisingly, it features a lot of Move interactivity with new gadgets like The Movinator, The Move Recorder, and The Paint Tool. It also comes with a whole slew of new collectible items that can be used in the Create Mode to craft your own levels with. This pack is a great excuse to pick up your Move controller again if you already have it, but it’s not a very compelling justification for rushing out to buy a set if you don’t. Much the same can be said for the Toy Story Level Kit, which includes 5 levels, 2 mini-games and 2 cut scenes, plus lots of new collectible creative objects, most of which are stickers. Both of these worlds are charming and fun and express the level of quality expected from the Media Molecule designers, as exemplified in the regular story mode (which is included in its entirety). It will only take a couple hours or so to see the worlds to their ends, but both are great examples of interesting themed level design and shouldn’t be skipped. Since this is a LittleBigPlanet game, the actual amount of playable content that resides on the Blu-ray disc probably accounts for less than one percent of the available content for the game. I’m speaking, of course, of the (literal) millions of levels created and shared online by other players. Sure, a lot of it is crap, but LittleBigPlanet 2 added many features to help you easily find the best player-created levels, including the ability to browse levels on your computer and add them to your queue to jump directly into on the PlayStation 3. You can still play LittleBigPlanet 2: Special Edition for its fantastic story player mode and the included extra worlds, but to ignore the online components of the LBP universe would be such a shame. Not to mention the completely different kind of fun you can find by delving into the ridiculously deep Create Mode. So now let’s tackle the big question from a new angle: Is LittleBigPlanet 2: Special Edition worth buying? Considering that Special Edition is quite obviously targeted at newcomers to LittleBigPlanet 2, the answer is absolutely yes… As long as you’re interested in the game and haven’t played it yet. All the better if you have some friends to gather together and enjoy an ebullient multiplayer experience on the couch. As of this review, the vanilla edition of LittleBigPlanet 2 is priced at $30 in certain online retailers, which is down from its reduced MSRP of $39.99. 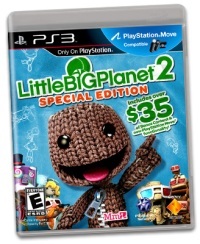 LittleBigPlanet 2: Special Edition, however, is only a few bucks heavier at $37 at certain online retailers, which is down from its current $59.99 MSRP. For a few dollars more, Special Edition is a no-brainer. Don’t miss out.